Ukrainian Orthodox Church of the USA - Uplifting Jubilee of Archpastoral Service! Uplifting Jubilee of Archpastoral Service! Hierarchs, clergy and faithful from across the United States of America, Canada and United Kingdom traveled to Washington, DC Metropolitan area on January 22, 2011 to honor His Eminence Archbishop Antony, ruling hierarch of the Eastern Eparchy and President of the Consistory of the Ukrainian Orthodox Church of the USA during the celebration of his 25th anniversary of episcopal consecration and ministry. His Beatitude Metropolitan Constantine and His Grace Bishop Daniel of the UOC of USA along with His Eminence Metropolitan Yurij and His Grace Bishop Andriy of the Ukrainian Orthodox Church of Canada joined Archbishop Antony at the altar of St. Andrew Ukrainian Orthodox Cathedral in Silver Spring, MD for the most important part of the celebration – the Holy Eucharist. Very Rev. Fr. 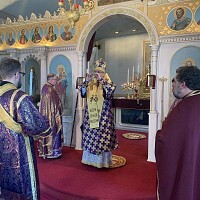 Volodymyr Steliac, pastor of St. Andrew Cathedral and nearly 50 clergy of the UOC of the USA and other Orthodox jurisdictions welcomed the hierarchs at the entrance to the cathedral for the Divine Liturgy on the Saturday following Theophany. They were also welcomed by Cathedral Board of Administration President, Olga Coffey and Sonya Krawec and Nadia Kolesnik from the Sisterhood, along with children from the parish Church School and those visiting from other parishes. Each child presented a bishop, including visiting hierarchs from other Churches, with individual bouquets of flowers. The Cathedral was filled to more than capacity with faithful who came from all over the country. Following the Gospel reading, His Grace Bishop Daniel reflected upon the meaning of the episcopal service in the life of a Church, recalling the lives of such Holy Fathers as St. Basil the Great, St. John Chrysostom, St. Gregory the Theologian and making reference to the 25 years of Archbishop’s ministry among the faithful of the Ukrainian Orthodox Church of the USA. The bishop spoke of the Archbishop’s attempts to further ecclesiastical unity among the faithful of the Church in Ukraine, his humanitarian efforts as well his dedication to the ministry of the UOC of the USA and his efforts to continually improve the life circumstances of the clergy of the Church on all levels. Bishop Daniel stated that during the years of the archbishop’s service, he continuously proclaimed the Good News with conviction and hope, to celebrate the Holy Eucharist and all the Mysteries of the Church prayerfully and fervently and to shepherd his flock with patient attentiveness to the gifts and needs of all. In that process, Archbishop Antony often stated that he matured and grew in the Spirit himself. “On the occasion of the 25th anniversary of your dedicated service in our Holy Church, we hasten to convey to you our personal prayers and whole-hearted best wishes, as well as those of the Ecumenical Patriarchate. We too, along with the Orthodox clergy and Christ-loving faithful that have gathered today, share in the joy and celebration of your gracious tenure. We express to you our warm congratulations and applaud your zealous and dynamic ministry in the service of the people of God. 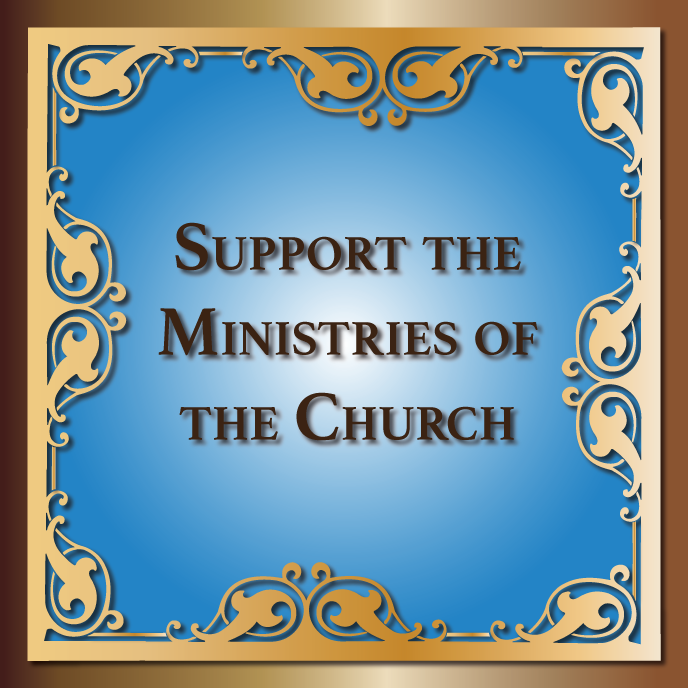 We appreciate your vibrant ministry and pray that our Lord will bestow upon you strength and spiritual joy so that you may continue to "rightly teach the word of His truth. From our Venerable See, the Mother Church of Constantinople, we confer our Patriarchal blessings upon Your Eminence, on this celebration, and to all those present, so that the Lord will grant "all that is good and profitable for your souls." His Eminence Metropolitan Yurij, newly installed Primate of the Ukrainian Orthodox Church of Canada, greeted Archbishop Antony at the banquet in behalf of his Church Administration and all his clergy and faithful, recalling their more than 40 year long friendship since first meeting in his first year and the Archbishop’s final year of studies at St. Andrew Seminary in Winnipeg, Manitoba, Canada. He spoke of the many times they have worked together on various projects as hierarchs of the Church and the many times that Archbishop Antony has taken part in the life of the Church in Canada. Bishop Andriy greeted in behalf of all the Canadian hierarchs – including Bishop Ilarion, who was unable to attend the celebration – and presented the Archbishop with a beautiful icon of St. Antony the Great for utilization in his liturgical and prayer life. In addition to the Orthodox hierarchs present at the celebration, Metropolitan Stefan Soroka of Ukrainian Catholic Archdiocese of Philadelphia, Bishop Emeritus Basil Losten of the Ukrainian Catholic Eparchy of Stamford, Bishop Ken Nowokowsky of Ukrainian Catholic Church of Canada and Bishop John Kudryk of Byzantine Catholic Eparchy of Parma also attended the celebration and delivered words of greetings to the Archbishop on his 25th anniversary of service. Greetings were also expressed from Archbishop Demetrios of Greek Orthodox Archdiocese of America, by Very Rev. Michael Rosco, representing Metropolitan Nicholas of Carpatho-Rusyn Orthodox Church, by the Ambassador of Ukraine to the USA, the Honorable Oleksander Motsyk, Christine Balko, CEO and Chairman of the Board of the Ukrainian National Credit Union, the seminarians of St. Sophia Seminary, the Cathedral Church School students, and over 30 other representatives of various religious and social institutions of the Orthodox and Ukrainian Community. The Ukrainian Ambassador to the United Nations, Yurij Sergeyev greeted His Eminence in South Bound Brook after participating in the Diving Liturgy and Great Blessing of Waters on the Feast of Theophany/Jordan, presenting him with an original icon of St. Andrew in traditional Ukrainian style. A special presentation was made by Mrs. Martha Misko, Sr. UOL President on behalf of the Ukrainian Orthodox League, honoring His Eminence Archbishop Antony with a donation of $10,000.00 made in his honor to the ministries of the Ukrainian Orthodox Church of the USA. A wonderful musical interlude during the program featured the sister vocal duet of Nadia and Nataliya Pavlyshyn and a presentation by Solomiya Gorokhivska on violin and Andrei Pidkivka on wind instruments. These performers greeted the Archbishop with their musical gifts and brought great joy to all the guests present. Towards the end of the banquet Metropolitan Constantine spoke of Archbishop Antony’s life and ministry and called upon the Archbishop to address the faithful gathered at the silver jubilee. The Archbishop spoke of his deep concern on the eve of his episcopal consecration that he would never be able to live up to what is expected of the office of Bishop. He thought in a fleeting moment that he was truly making a sacrifice in giving his life over to God, but very quickly realized that it was Christ, Who was offering Himself to the candidate. His Eminence spoke of the great mystery of events that took place 25 years ago – on October 6, 1985 – when he knelt down before the altar of St. Andrew Memorial Church in South Bound Brook and was gifted with the reality of the Grace of God, which would fulfill that which was lacking in him and strengthen him along the entire path of his episcopal ministry. He spoke of the struggle for all bishops and for any rank of the priesthood to remember at all times that they are ministers of Christ -- to His Church and to His people. The bishop cannot add anything to the Good News or offer any salvation on his own. He can only assist those entrusted to his spiritual care in growing in their faith and following the narrow path, which leads to God’s Heavenly Kingdom. The Archbishop offered special and emotional words of gratitude to many people for their influence on his life. He presented a bouquet of flowers to his mother Dorothy, who was overcome with emotion at the long standing ovation given to her by the entire gathering. His Eminence made special mention of all those who provided very specific and powerful spiritual and emotional presence in his life, all at the appropriate times: the members of his family, his brother Bishops – Metropolitan Constantine and Bishop Daniel, Protopresbyter William Diakiw and his family, V. Rev. John Nakonachny, Emil Skocypec, Protopresbyter Michael Rosco, among others. 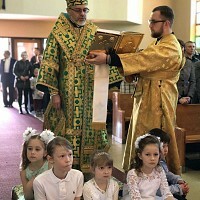 He expressed his gratitude to all the hierarchs, both Orthodox and Catholic, present for the celebration, to the Cathedral Choir for the spiritually uplifting responses during Divine Liturgy. He offered most special appreciation to V. Rev. Fr. Volodymyr Steliac and his wife Dobrodiyka Marta, to Olga Coffey and the Cathedral Board, who dedicated many hours of preparation for the anniversary celebration. He also thanked all the members of the Cathedral present and other guests who came – even from as far away as London, England in the person of V. Rev. Bohdan Matvijczuk, of the UAOC in Diaspora. On the following day, Sunday, January 23, 2011, His Eminence Archbishop Antony served a Divine Liturgy of Thanksgiving at St. Andrew Cathedral, while the parish family greeted their hierarch on his upcoming Name’s Day and birthday. The Liturgy was called by many "a liturgy of thanksgiving" — and words of gratitude flowed freely among the archbishop, his priests and the lay faithful. God grant you many years, Archbishop Antony! Watch "Voice of America" Coverage of this event on YouTube!